If you plan on making your own mayonnaise, hollandaise, or Caesar salad dressing, you will need to add raw eggs to the recipe. Since raw eggs can carry salmonella bacteria, using pasteurized eggs is safer. Pasteurized eggs have been partially sterilized, eliminating the risk of causing food-borne illness. But what if you can't find pasteurized eggs in the market? Lucky for us there is an easy method to pasteurize your own eggs—and you can do it in the microwave, no less! Pasteurization is a process where food is heated to 140 F, killing harmful bacteria. Egg yolks would normally start to cook at 140 F, but this process allows you to use the microwave to pasteurize egg yolks without cooking them. The process works by adding an acid to the egg yolks—either in the form of lemon juice or vinegar. Adding acid raises the temperature at which egg yolks cook, so the eggs can be heated to 140 F—killing the bacteria—but won’t actually cook. Pasteurizing eggs in the microwave is a simple process that only takes 5 minutes. Be sure to gather all of the ingredients and tools ahead of time. Do note this important caveat: You'll need no fewer than three clean whisks (clean forks are okay, too) on hand to follow this procedure; three separate utensils are essential to the pasteurization process. The other tools you will need are a microwave-safe bowl, plastic wrap, and, of course, the microwave oven. In just five steps you can take regular, raw eggs and make them safe to be used in mayonnaise and other recipes requiring raw egg yolks. 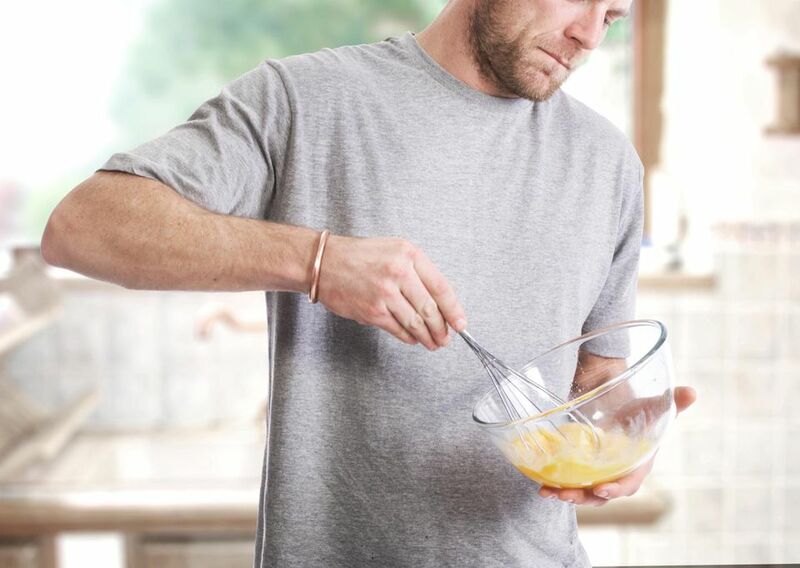 Separate two eggs, collecting the yolks in a microwave-safe glass bowl. Whisk the yolks thoroughly using the first of your 3 clean whisks. Add lemon juice or vinegar and whisk again using the same whisk. Add the water and whisk again (same whisk). Seal bowl with plastic wrap and place it in the microwave. Set aside the current whisk and do not use it again. Have the next 2 whisks close by as you will use them in quick succession. Heat the egg mixture on high until the surface begins to rise. Once you see this, cook for 8 more seconds, then immediately remove the bowl from the microwave, remove the plastic wrap, and whisk the yolks vigorously with one of the clean whisks. Immediately return the bowl to the microwave and heat on high again until the surface begins to rise. Continue for 8 more seconds, then remove, and whisk vigorously with the third clean whisk until the mixture is smooth and creamy. Now the egg yolks are safe to use in any raw-egg preparation. Three whisks (or forks) are absolutely essential. Don't try to wash and dry the same whisk and re-use it; it'll take too long and the temperature of the eggs will fall too fast. Never attempt to use an unwashed whisk for the second or third whisking as the unclean whisk will contaminate the egg mixture and defeat the whole purpose of the pasteurization process. This recipe can easily be increased. For example, you can increase the number of yolks to three. Make sure to also increase the cooking times to 10 seconds from the moment the surface of the eggs starts to rise.